Great for role playing and storytelling, this 42 piece Wooden Village People set represents the diversity of an Australian community very well. A high quality, 2 cm thick wooden figures, which are screen printed on both sides using heat transfer technology for years of play. 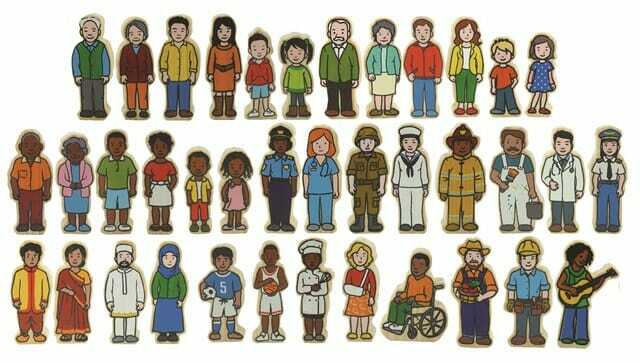 This set of 42 pieces comprises of a diverse range of multicultural families and occupations beautifully illustrated for an wide variety of ages, ethnic backgrounds and gender. Varies in height from 6 to 8 cm. Suitable for children from the age of 1+ years.